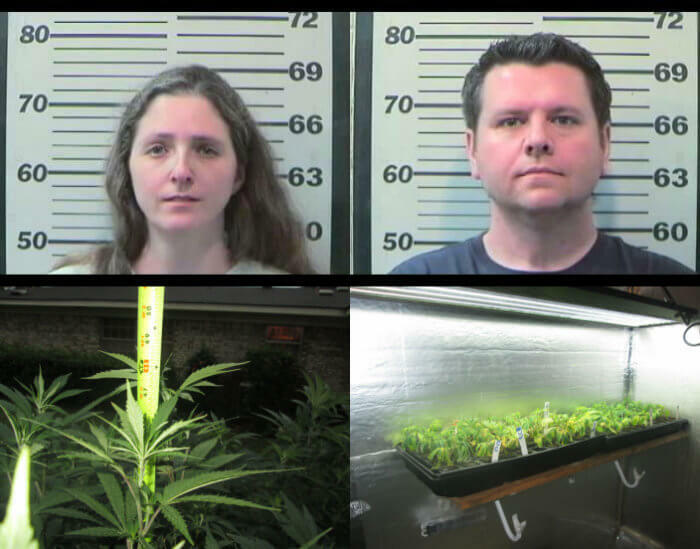 Deputies arrested a couple in west Mobile Wednesday after a tip led to the discovery of 60 marijuana plants, various marijuana products and other drug paraphernalia in a home they shared with a child under the age of 16. According to the Mobile County Sheriff’s Office, Jaclyn and Jessie Forbes were arrested for trafficking marijuana, 2 counts of Possession of Narcotic paraphernalia and chemical endangerment to a child after a search warrant was executed at their home on Maryknoll Drive. An MCSO spokesperson said an anonymous tip was sent to the office about a marijuana growing operation, which led undercover narcotic investigators to visit the home Feb. 20. On the scene, deputies say they found approximately 60 marijuana plants, marijuana candy, vape oil and a child under the age of sixteen. Police have not yet clarified what relationship the suspects have to the child. Jaclyn and Jessie Forbes, top right, were arrested for trafficking marijuana, two counts of possession of narcotic paraphernalia and chemical endangerment to a child on Jan. 20. Deputies also released a number of pictures from the scene that appeared to show a grow operation and the items needed to make edible marijuana products. Both suspects were booked into the Mobile County Metro Jail Wednesday and had yet to be released as of 5 p.m., Jan. 20. According to jail records, Jaclyn Forbes, 35, does not have a criminal record locally. Jessie Forbes, 39, has a few prior misdemeanor charges, though none appear to be drug-related offenses. Officials said the information about the Forbes’ alleged drug operations came in through the MCSO Crime Tip program. The department said anyone who wishes to provide about other crimes they suspect can do so anonymously at mobileso.com/crimetips.